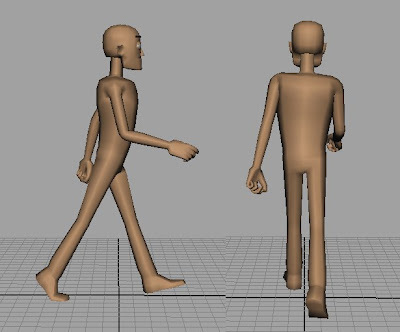 One of the last things I did this term at Duncan of Jordanstone was give a Maya animation workshop, where I showed how to go about creating a basic walk cycle. I won't go into too much detail here, but will just show my approach to it. 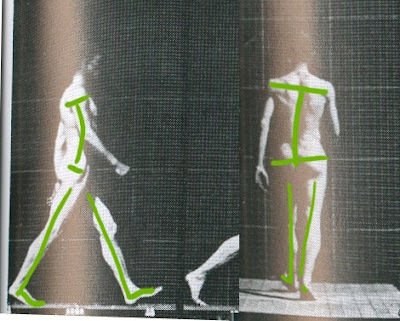 The following technique can be applied to many different walk cycles. Usually I would add more character or emotion to a walk, but for simplicity I've made a neutral male cycle. I think it's important to start with some reference, ideally some live-action footage. Ordinarily I'd go through the footage, try to exaggerate the traits that make the cycle unique, but here I'm going to be making a reasonably faithful copy. The reference I'll be using is from a Muybridge book. Apologies for the quality of the scan, hopefully you can still see the image. This is normally called the contact position which is a good one to start with. The legs are at an extreme and also the body is at an important stage of transition - it has accelerated down into this position and from this pose, as the foot catches it's weight, it will start to decelerate. If we now look at the balance in the pose, you can see that the body mass is reasonably centred, with a similar amount of the body on both sides of the red line. 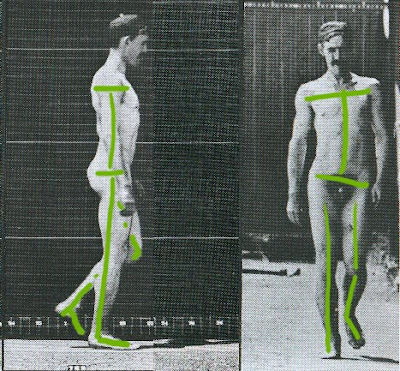 The hips are perhaps slightly further over the contacting (left) foot, were as the chest is lagging behind the action, with slightly more of it on the standing foot. Now looking in detail at the pose, there are some important things to note; firstly, the contacting leg is straight. In the rear view picture you can see the hips have rotated round with the leg, and also tipped, so the hip's lowest corner is over the contacting leg. The chest counters the hip's rotations in both axises, and the opposite arm (to the leg) is in a forward position. Note that the legs are not vertical, they angle in slightly. There is also a change in angle from the leg to the foot too. In the profile picture we can see the chest and hips have rotated in opposite directions to arch the back. I like to use traditional animation charts so I can see were my keys and breakdowns are. I have now put my contact pose at frame 1, and the same pose at my last frame (43), therefore I can now be sure the walk will cycle seamlessly. This pose can still be edited, but you must be sure to copy any changes onto both frames. The next step is to create an exact opposite of your contact pose and place it in the middle of your cycle (22). 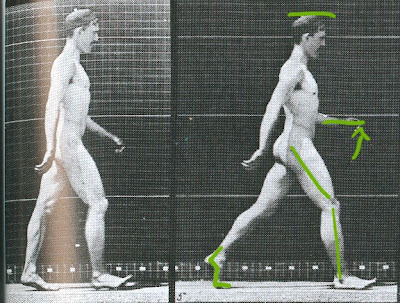 Feet should be as accurate an opposite as possible to avoid foot slip later, while chest and arm positions can be slightly different. This will help make your cycle feel organic. * When playblasting or rendering your cycle, adjust your time-line so you don't include both contact poses (i.e. frames 1-42). Next comes the cross-over or passing position, so called because it is the point were the feet pass each other. If we look at the balance of this pose, you can see the weight has shifted onto the standing leg, more of the body is on the left side of the red line. If we look at it in more detail you can see that the hips have rotated to a more neutral position. However, one side has fallen as the foot has lifted, the lowest side is over the lifted foot, the chest once again counters this rotation. Other things to observe are that the standing leg is straight and therefore the body is higher than it was at the contact position. The lifted foot when viewed from front on is not straight to camera, there are subtle changes in angle from the upper leg to the lower leg, and again from the lower leg to the foot. The hands are at almost the same position but note their poses suggest drag to their direction, either moving forward or going backwards. In the side view you can also see the hips and chest are rotated so the back is not as arched as it was in the contact pose. Now you can create this pose and it's opposite, then put it into your animation halfway between the contact poses. The chart now looks like what we see pictured above. 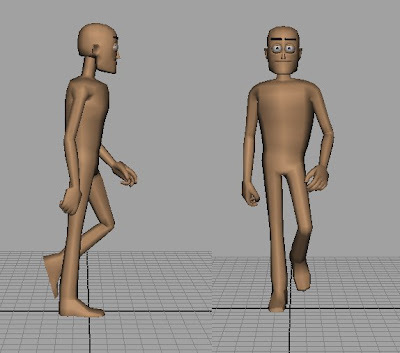 With our key poses applied, our character is essentially walking, although rather crudely. All we need to do now is to add some breakdowns to help the sincerity of the animation. The first breakdowns I like to add are the highest and lowest points of the body - seen here in these two pictures from our Muybridge reference. We can see that the standing leg is stretched up in the first picture and then, in the second picture, the landing leg is bent as it catches the weight of the body. It is worth noting that the left arm is higher and further forward than in our contact position. It is also worth noting that in the second picture the rear leg is still in contact with the ground. In a walk there is a moment when both legs are simultaneously in contact with the ground. I've made a close up composite of the head in the two pictures to make the vertical motion clearer. As you can see the thicker white line is level with the bottom of the man's nose in the first picture were it is level with his brow in the second. Here are my up and down breakdowns. Again, I create opposites of them. And this shows where I have applied them to my animation. I have put my 'up' positions roughly half-way between my crossover and contact poses, but my 'down' breakdown is just a couple of frames after the contact keyframe. This is to give the animation a sense of weight and also serves to create a change in the timing. Next I like to create a sense of follow-through in the body. By offsetting the down of the body with the down of the chest, head translation and head rotation. Much like I talked about in the bouncing ball lecture. So, two frames after the hips lowest point, I've put the down position of the chest. Then two frames later, the head's lowest point (in translation - called 'neck' here) then 1 frame later, the lowest point in the head's rotation. 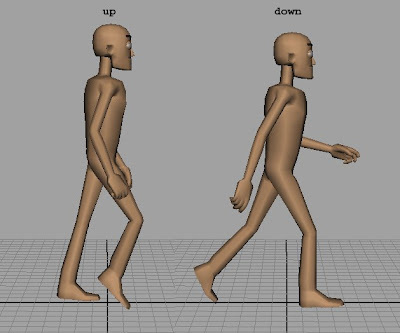 Walk cycle produced for animation workshop from Brendan Body on Vimeo. And here is the walk cycle I created. I've tweaked some of the curves a little in the graph editor, and also cleaned up the arcs of the feet and hands. I would usually polish this further but I have left it quite rough to show the result of just following this simple formula. Great post. I'm hoping to learn some 3d in the new year and I'm sure I'll be visiting your blog again. Cheers. Excellent and well documented resource. As an industry veteran, it's been a while since I've done walk cycles and this was very helpful in bringing much of my previously learned (and mildly forgotten) information to mind again. This is really helpful for me, a stop motion animator coming over to the "dark side" (CG ;) Great to see a methodical workflow - that's what I've been struggling with most in the transition from the linear world of stop mo to the free flowing, back and forth, tweak-til-the-cows-come-home world of CG. More tutorials please!